The unique and stylish Smooth V350 Spinner Bike features a sleek frame, wide comfortable seat, multi-position handlebars and a heavy flywheel. It is a perfect combination to give you an intense workout. The LCD display shows a course profile plus readouts including time, distance, and speed. 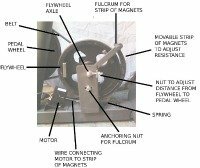 A resistance knob is located in front of the rider to increase or decrease resistance to the flywheel, making the pedaling workout harder or easier. UPDATE: The V350 spinner bike is no longer available. 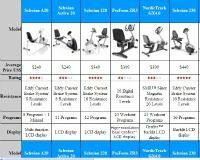 Check out the latest Smooth exercise bikes here to compare the new models. The Smooth V350 Spinner Bike has a welded steel frame, a wide padded seat that adjusts for multiple user heights, a balanced flywheel, and handlebars with multiple hand positions. The stylish frame includes an upper shroud to give the flywheel protection from dripping sweat. Smooth Fitness offers one of the best warranties in the business: 3 years on parts and 2 years of in-home labor. Smooth Fitness debuted their exercise bike line in 2011 and look to offer the same outstanding quality and customer service that has made them the leader in the elliptical and treadmill equipment fields. While there aren’t any customer reviews yet on the new 2011 Smooth V350 Spinner, we believe this bike will be a strong performer for Smooth Fitness. 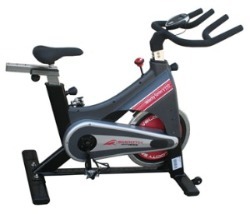 At just $599, it is in the same price class as spin bikes from Lifespan, Bladez, and Fitnex. These exercise bikes come with 31-lb to 40-lb flywheels and offer similar warranties, so it is a matter of personal preference which one you prefer. However, the Smooth V350 Spinner Bike stands outs because of the sweeping frame and the wheel and chain shrouds; it doesn’t look like any other spinner bike on the market. While the look will appeal to some users, it will be a turn-off to others who want a spin bike to look like a road bike, and not like an indoor upright.